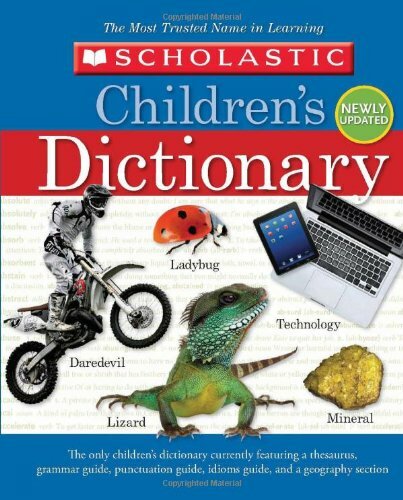 The updated Scholastic Children's Dictionary features nearly 200 new entries that will keep this evergreen title current and competitive. The new words have been carefully chosen. They are words that kids are likely to encounter, and we are confident that they are words that will remain in use for years to come. New entries include air bag, browser, cell phone, DVD, Internet, server, SUV, and Web site. The updated Scholastic Children's Dictionary still boasts the elements that made the original edition so beloved by children, parents, and teachers. Pronunciations are spelled the way they sound--not with confusing symbols and schwas. Sample sentences and cross-references help to make words even easier to understand, and full-color illustrations provide additional information. This was a great dictionary for a child that brings together so much for the child. It is filled with a ton of entries and they are written in a way that children can understand. On top of this there are wonderful images that accompany quite a few of the entries as well. I gave this to my eldest daughter and she has been finding it very interesting and I have even caught her going through a number of the records by herself without even being asked to do it (which is always a positive thing)! I also liked how much information was given about each word, so you not only got to understand the meaning, but also so much more. This is truly a complete work for a child and is a great reference for them as they get older!